Pantheon. Hardcover. B005ZO54VQ Very Good Condition. Has some wear. Five star seller - Buy with confidence! . Very Good. Pantheon. Hardcover. 0375424695 New Condition. . New. Pantheon. Hardcover. 0375424695 New Condition *** Right Off the Shelf | Ships within 2 Business Days ~~~ Customer Service Is Our Top Priority! - Thank you for LOOKING :-) . New. Pantheon. Hardcover. 0375424695 Like New Condition. . Fine. Blackstone Audio, Inc., 2010. Audio Book. Very Good. Audio CD. 8 BRAND NEW AUDIO CDS COLLECTOR EDITION in the clamshell case. NEW IN THE SHRINK WRAP. Just a bit of shelf wear to the box. Enjoy this GIFT QUALITY AUDIO CD performance for your home and library..
Pantheon Books, 2010. (The Unwritten Rules of America's Pastime) Large, sturdy book, black cloth spine, orange boards, very bright silver lettering on spine, 294 pages plus brief biographical notes. DJ glossy in shades of blue, a color photo of a catcher's mitt with surface covered with notes. DJ and book, both Very Fine.. First Edition. Hard Cover. Fine/Very Fine. Pantheon, 2010-03-09. 1. Hardcover. Used:Good. Anchor Books. Sports & Recreation. New. Brand New: This item is brand new unopened, never used and still in its original manufacturer condition. Anchor. PAPERBACK. 030727862X Special order direct from the distributor . New. Pantheon. Hardcover. 0375424695 First Edition. Crisp pages and tight binding. Light shelf wear on dust jacket. . Fine. Anchor. PAPERBACK. 030727862X Remainder mark . Fine. U.S.A.: Pantheon, 2010. Book. Near Fine. Hardcover. Signed by Author(s). 1st Edition. Hardback in near fine condition with a near fine dust jacket. Signed by Author. Anchor. PAPERBACK. 030727862X Minor shelf wear . Very Good. Anchor. PAPERBACK. 030727862X signs of little wear on the cover. . Very Good. Anchor. PAPERBACK. 030727862X *LIKE NEW* Ships Same Day or Next! . Fine. Anchor. PAPERBACK. 030727862X *BRAND NEW* Ships Same Day or Next! . New. U.S.A.: Pantheon. Hardcover. 0375424695 Stated First Edition, with the full number-line. No marks or damage from past owners, not a former library book, not a remainder or book club, not clipped, hardcover. 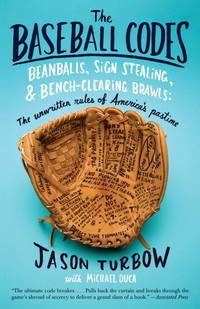 Hilarious, surprising, and vastly entertaining,The Baseball Codesuncovers the hidden rules of baseball. Everyone knows that baseball is a game of complicated rules, but it turns out to be even more complex than we realize. InThe Baseball Codes,Jason Turbow and Michael Duca take us behind the scenes of the great American pastime. Players talk about the game as they never have before, breaking the code of secrecy that surrounds so much of baseball,... both on the field and in the clubhouse. We learn why pitchers sometimes do retaliate when one of their teammates is hit by a pitch and other times let it go. We hear about the subtle forms of payback that occur when a player violates the rules out of ignorance instead of disrespect. We find out why cheating is acceptable (but getting caught at cheating is not), and how off-field tensions can get worked out on the diamond. These tacit rules are illuminated with oftenincredible stories about everyone from national heroes Mickey Mantle and Willie Mays to notorious headhunters Bob Gibson and Don Drysdale to true eccentrics like Rickey Henderson and Dock Ellis (who once pitched a no-hitter while on LSD). The Baseball Codesis an absolute must for every fan of the game. All books shipped within 24 hours with U.S. Postal Service Delivery Confirmation, each order is packaged in a new box with bubble wrap, and always your satisfaction is guaranteed. . Fine. 2010. 1st Edition. Pantheon, 2010-03-09. Hardcover. Fine/Fine. Fine orange boards with black cloth stripe and gilt lettering along spine. Binding and hinges tight and square; contents clean and unmarked. Fine dust jacket not price clipped; light rubbing along edges. 294pp. Index. First edition - second printing. Additional photos available upon request. All items carefully packed to avoid damage from moisture and rough handling. Anchor. PAPERBACK. 030727862X BRAND NEW, GIFT QUALITY! NOT OVERSTOCKS OR MARKED UP REMAINDERS! DIRECT FROM THE PUBLISHER!|0.51 . New. Anchor, March 2011. Trade Paperback. Used-Very Good. Pantheon. Used - Very Good. Great condition for a used book! Minimal wear. Anchor. PAPERBACK. 030727862X . New. Anchor. Paperback. 030727862X . New. 2011-03-22. Pantheon. Used - Very Good. Ships from the UK. Former Library book. Great condition for a used book! Minimal wear. 100% Money Back Guarantee. Your purchase also supports literacy charities. Pantheon. Hardcover. 0375424695 Ships promptly from Texas. . Very Good. 2010. Anchor. Used - Good. Good condition. Slightly dampstained. Knopf Doubleday Publishing Group, 2011. Paperback. Acceptable. Disclaimer:A readable copy. All pages are intact, and the cover is intact. Pages can include considerable notes-in pen or highlighter-but the notes cannot obscure the text. At ThriftBooks, our motto is: Read More, Spend Less.Dust jacket quality is not guaranteed. Knopf Doubleday Publishing Group, 2011. Paperback. Good. Disclaimer:A copy that has been read, but remains in clean condition. All pages are intact, and the cover is intact. The spine may show signs of wear. Pages can include limited notes and highlighting, and the copy can include previous owner inscriptions. An ex-library book and may have standard library stamps and/or stickers. At ThriftBooks, our motto is: Read More, Spend Less.Dust jacket quality is not guaranteed. Knopf Doubleday Publishing Group, 2010. Hardcover. Good. Disclaimer:A copy that has been read, but remains in clean condition. All pages are intact, and the cover is intact. The spine may show signs of wear. Pages can include limited notes and highlighting, and the copy can include previous owner inscriptions. An ex-library book and may have standard library stamps and/or stickers. At ThriftBooks, our motto is: Read More, Spend Less.Dust jacket quality is not guaranteed. Knopf Doubleday Publishing Group, 2010. Hardcover. Good. Disclaimer:A copy that has been read, but remains in clean condition. All pages are intact, and the cover is intact. The spine may show signs of wear. Pages can include limited notes and highlighting, and the copy can include previous owner inscriptions. At ThriftBooks, our motto is: Read More, Spend Less.Dust jacket quality is not guaranteed. Knopf Doubleday Publishing Group, 2011. Paperback. Good. Disclaimer:A copy that has been read, but remains in clean condition. All pages are intact, and the cover is intact. The spine may show signs of wear. Pages can include limited notes and highlighting, and the copy can include previous owner inscriptions. At ThriftBooks, our motto is: Read More, Spend Less.Dust jacket quality is not guaranteed. Anchor. Paperback. POOR. Noticeably used book. Heavy wear to cover. Pages contain marginal notes, underlining, and or highlighting. Possible ex library copy, with all the markings/stickers of that library. Accessories such as CD, codes, toys, and dust jackets may not be included.